I get asked questions almost weekly about how to start a website / blog. So I wanted to use this post to answer some of the questions I get asked most often and to guide you into the right direction if you're just starting out. If I don't cover something and you still have questions, please leave them in the comments and I'll be happy to answer them. First of all, congrats; starting a blog can be a very rewarding experience and I'm glad to be here to guide you and step up your blogging game. Also just as a disclosure: I will be talking about how to start a blog utilizing Blogger.com . As it is the platform I am very familiar with and currently using. I am by no means a computer / code wiz; I am just sharing what I have learned in my 3 1/2 years of blogging and running a site. There's many other platforms to start a site, but I will be talking about Blogger.com because I use it AND it is super simple to use and navigate. This post is also for those just starting out, so if you currently run a blog, this will not be as helpful! Ok, enough yapping, lets gets started! Since I'll be introducing this using Blogger.com I'm going to assume that is the platform you have chosen to use lol. 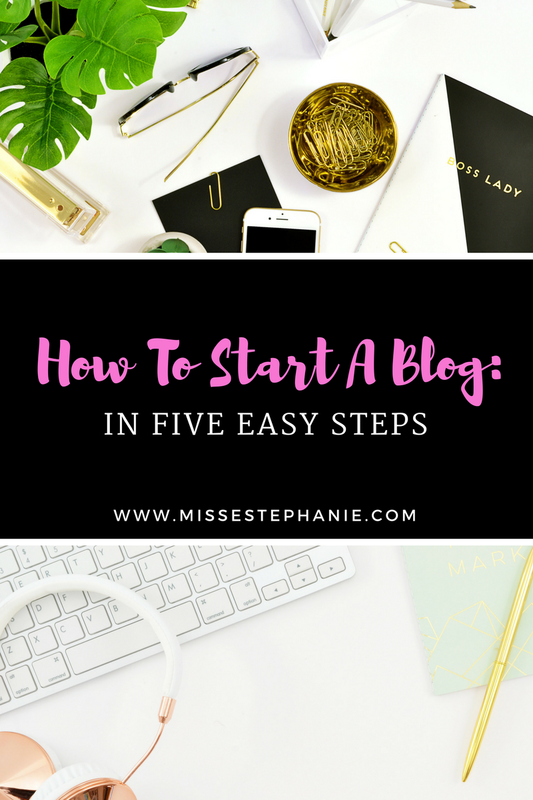 So to start a blog, I've compiled these 5 easy steps in getting you going! 1. GIVE IT A NAME! WHAT IS YOUR BLOG / WEBSITE GOING TO BE CALLED? Of course, your website needs a name, so think of one that's memorable and means something to you! And also one that the domain isn't currently taken (we'll get to what a domain name is later). So take a couple of days to really think about what your site will be called. 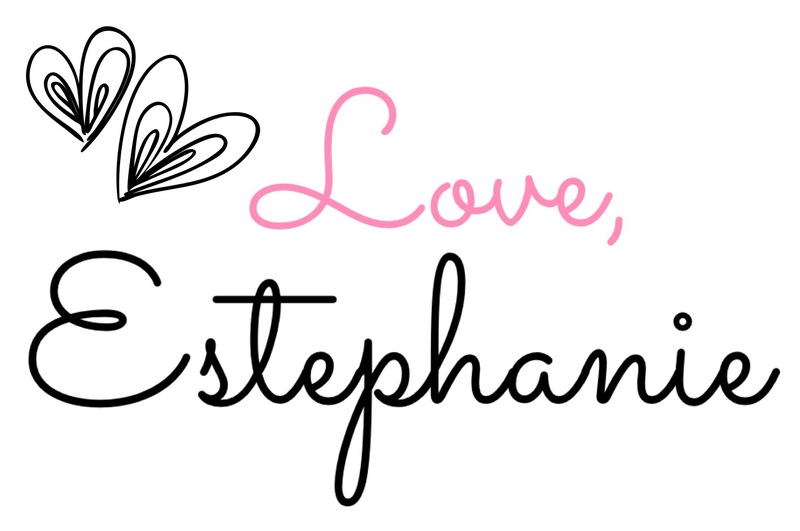 For me, it was pretty simple (MissEstephanie.com), I always feel the need to insert my name in something that I've created...make sense right? Especially now-a-days, there are many blog names that sound the same. So make sure the one you choose stands out and is unique all on its own. 2. CHOOSING A PLATFORM TO START YOUR BLOG! - So sign in and register your email. 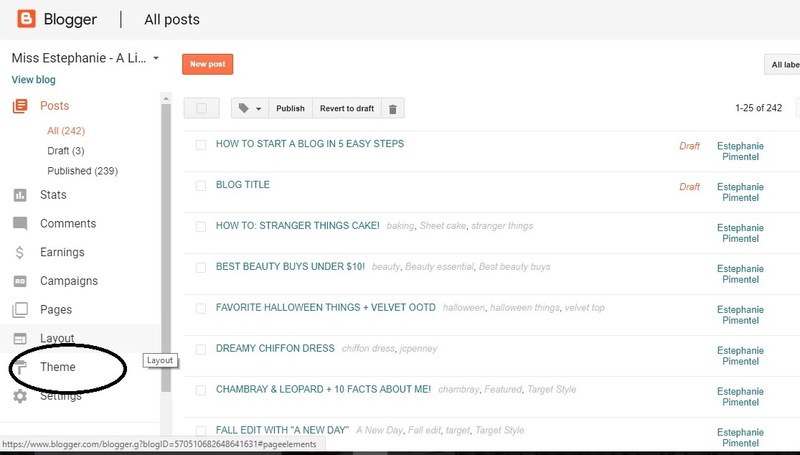 If you have a gmail account, its even easier because Blogger is integrated with google! -Description (this is optional, but it could be the "tag line of your site") For instance, mine is "Fashion fades, Style is eternal. All of this can be edited later on, especially if you want to add a graphic of your logo. 3. GET A DOMAIN NAME FOR YOUR SITE! What is a domain name you ask? It's basically the name of your website and what people will type in when they are trying to find your website. When you first register to blogger.com your URL for the blog will be : blogname.blogspot.com. This is because you have not yet purchased a domain name. When you purchase a domain name, it basically drops the .blogspot.com portion and makes the URL to your site appear clean and more "visible"
Purchasing a domain name is super easy, especially with Blogger because you could go ahead and purchase it with Google Domains! I believe its about $12 a year, and you have to renew every year (Don't worry, they'll send you email reminders to renew so you do not forget!). I purchased 2 years for $24 so I wouldn't have to worry about it. So, this is what I mentioned above as to choosing a name that isn't taken by someone else. If you search your current blog name (or name you have in mind) in Google domains and it is taken by someone, you cannot use it! So make sure to check this out before naming your site. If this is making you dizzy, don't worry, Google domains website is very user friendly and easy to navigate, and they have a step by step process. Ok, now that you have your domain name set up...its time to set up your first post! 4. WRITING YOUR FIRST BLOG POST! Yay, you have come down to finally writing your first post! If you've been thinking about doing this for quite some time, I would suggest to have a couple of posts ready ( a minimum of 5-6 to start!) before you launch your blog...just so that you have content up for your audience! Here is a photo of how it looks when you're writing the post. 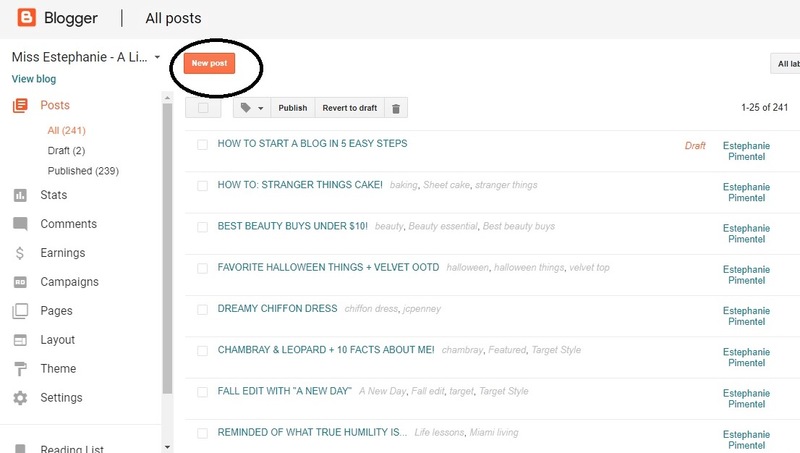 At the top, add your title; this will be the title name of the post when you post/publish on the blog. Also here are the buttons that I feel will be used the most: Links and photos. Adding Labels is also important. All you have to do here is type KEY words of what your blog post is actually about. That way if someone is searching your site for something specific, they will find it quickly if you tagged a specific blog post with helpful "labels". 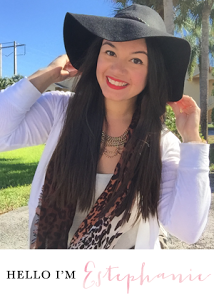 For instance, if my blog post is titled: "Leopard scarf + over the knee boots" . I would write in the "labels" section as follows: Leopard scarf, boots, over the knee boots", etc. 5. ADDING A TEMPLATE TO YOUR BLOG! Now this step can be optional but I totally feel that you should do it! This is where you could play around with your site and give it some character and really brand your overall message of what you're blogging about. Adding a template is almost like playing dressup...but instead its with a blog! A template adds a more uniformed look to your site and honestly keeps it from looking so plain. Blogger.com offers tons of free and great templates; especially if you're just starting out. But, if you're feeling a bit fancy and could spend the $ (especially if you're taking the blog on a more serious path) invest in a nice template! The current site template I use is from Georgia Lou Studios ! They have tons of templates for Blogger at really reasonable prices. They also have incredible customer service and have endless helpful articles. I cannot recommend them enough! -Navigate to where it says themes on the bottom left corner. -Click edit html and copy paste the code that is provided when you pick a theme of your choice. Now there's tons of ways to tweak and make the template your own. Which you would have to navigate to "Layout". Title, Body and whatever widgets and you decide to add on the right sidebar (social media widgets, calendar, subscribe box, etc). It's essentially how everything is set up when your blog is live. Blogger already comes with tons of these "plugins" all you would have to do is simply click "add gadget" and just choose which ones you could benefit from.! I think that's it! Let me know if you found this post helpful or if I missed anything. As always, you could ask your questions in the comments. One thing I have yet to figure out. Is how do you change font sizes? For example your steps 1) 2) etc. are in a different size than the rest of the content. Let me know if you know how to do different font settings throughout. I love blogger and blogging. Just haven't purchased my domain yet. If you get a chance, check out my blog and give me feedback. I'd love to hear from another blogger. Thanks for your question! 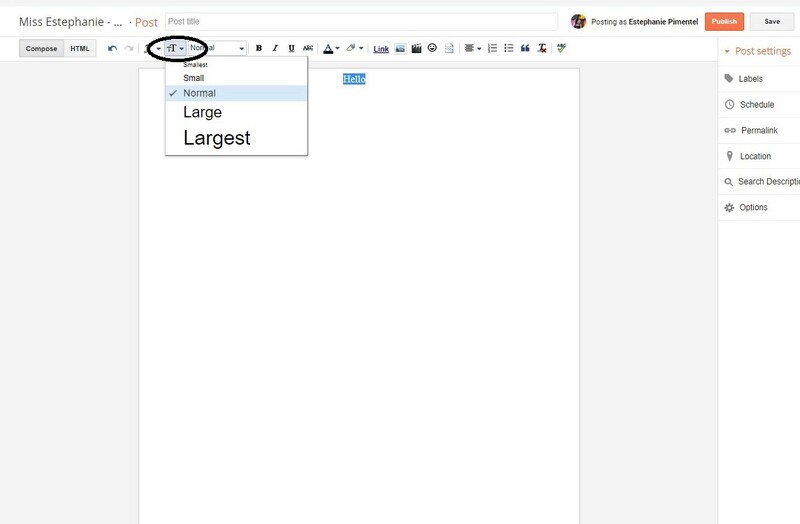 To change the font sizes you simply highlight the text you want to enlarge and then click the button with the two "T's" and pick the font size there! its right next to the button where you could also change the type of font you are using. And no worries, you could purchase your domain whenever you feel is right.